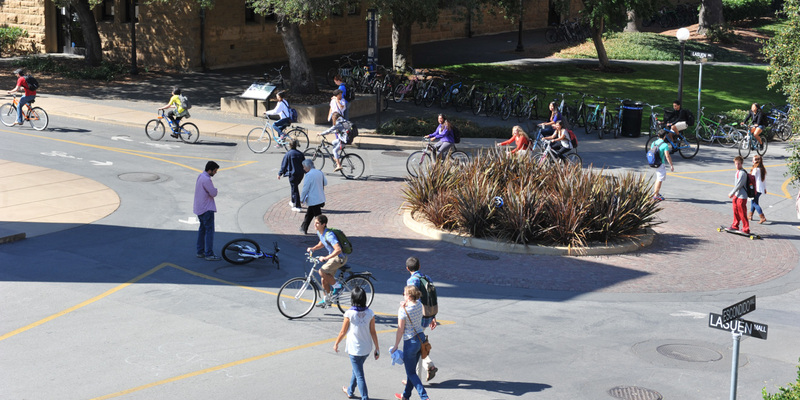 Bike tickets are the bane of many students' existence but police officers say the enforcement if to increase bike safety (Stanford Daily file photo). Bike tickets are the bane of many students’ existence but police officers say the enforcement if to increase bike safety (Stanford Daily file photo). This is a question commonly asked by students right before getting ticketed for biking through a stop sign on campus, according to Santa Clara County Sheriff’s Deputy Allen James. The answer: the Anchovy Effect. The Anchovy Effect, a term coined by James himself, means that, just like anchovies, bicyclists often travel in packs, which prevents police from stopping everyone who violates a traffic law. Still, in the past year, 1,311 citations have been given on campus for failure to stop at a stop sign, according to law enforcement records technician Lydia Morgan-Herman of the Stanford University Department of Public Safety (SUDPS). James said that because the police would much rather educate students on bike safety laws than force them to pay fines, he started a bicycling equivalent of traffic school seven years ago along with Ariadne Scott, the Parking and Transportation Services biking coordinator. The Bike Diversion Program holds one-hour classes three to four times a month to promote bike safety and provide an economical alternative to paying a hefty fine. Public Information Officer Bill Larson, who is in charge of crime prevention and community safety, said that the classes help students understand the reasoning behind traffic laws. Katie Dudley ’18 was ticketed for running a stop sign recently and originally thought she would have to pay the $200 fine. Noting that the 4 p.m. class time makes it difficult for athletes to attend, she said she was lucky that she had practice off the day of the next class. Dudley encouraged her friends to avoid the hassle of dealing with the ticket by following the traffic laws. Spreading the word about bike safety is one of the main goals of the class, according to James. “We hope that you will be a steward for good behavior and to go out and help your friends be safer and better citizens of the community,” he said. Since 2008, over 6,000 people have participated in the Bike Diversion Program, James said. As enforcement efforts have stepped up, class sizes have risen from 10 to 20 people per class to around 50, according to James. Though the class is typically comprised of students who have received tickets, anyone can come to learn more about bike safety and laws. James said that one of the most impactful parts of the program focused on wearing helmets. The class has received funding for free helmets, and by the end of each session, James tries to get a few people to pledge to wear helmets when bicycling. Larson said that the class does more than just talk about hypotheticals — James and Scott have brought in trauma surgeons to share their real-world stories. “They come in and talk about people they’ve operated on [that] ended up with traumatic brain injuries,” Larson said. James said he would like to see more students have easy access to the course material, which is why he hopes for it to some day become a mandatory pre-orientation class to accompany the alcohol and sexual assault education courses or even a mandatory part of New Student Orientation. “Since we haven’t been able to be officially added to NSO, we’re going to try to get something online within the next year or so,” James said. Expanding the reach of the Bike Diversion Program is important, James said, because a little education can go a long way in making sure bicyclists follow traffic laws and ride safely.